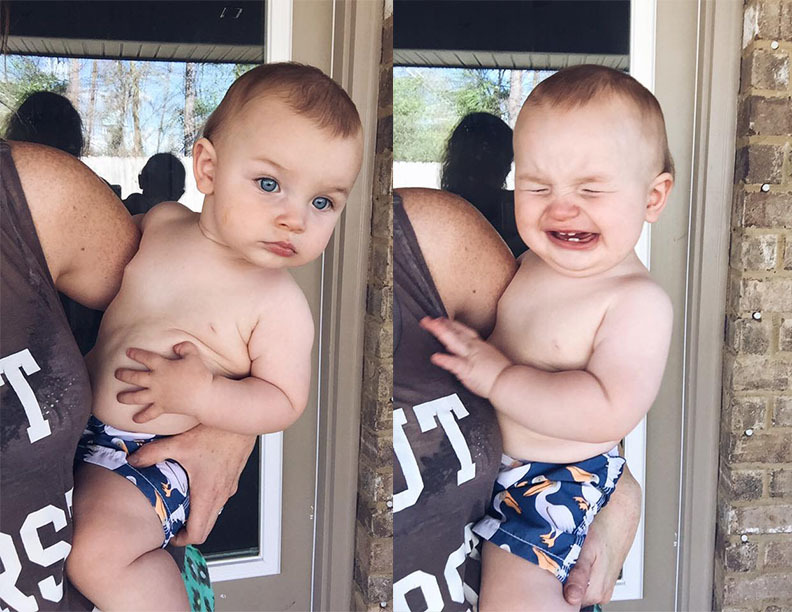 How is that my mini man is 9 months old? Our last single digit month! This guy has had some major milestones over the past month that I'm so excited to share! First can we talk about the above pictures though? Clearly he's thinking 6 rolls are the new 6 pack. And that whiney face is after I told him he's too young for the girls he was eyeing ;) He is sleeping through the night, but is co-sleeping. I've found he will nap on his own if he's taking a really good nap, but otherwise he is just like Vivian in the sense he likes to sleep on someone. He is a chatterbox and still the biggest flirt! He hasn't quite said any words just yet, but when he babbles we do here "mama" and "dada" every now and then. Any time the ladies give him any kind of attention he is a ham! I think he probably weighs somewhere between 23-25lbs (our 9 month appointment is tomorrow) as he's always been bigger length and weight wise since he was born! And you can definitely tell he's not missing any meals! Big man loves to eat! He is still breastfeeding but not nearly as much now that he's exploring solid foods. 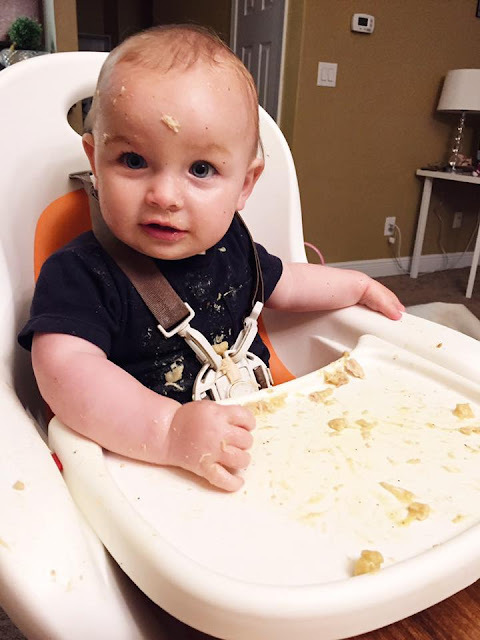 With Vivian, we did baby food for a while & slowly introduced solid foods, Finn is the complete opposite. He will eat baby food but he is much much more interested in whatever we're eating, mostly whatever Vivian is eating. So far he loves peaches, mum mum's, and waffles. We've also given him eggs, bread, the cereal puffs, apples, and the other night he even got chicken and dumplings and pretty much destroyed it! He has 4 teeth and isn't quite crawling just yet. He will get up on all fours and kind of slide across the floor like a slug, haha. But I would say definitely it won't be long give or take a few days! I'm sure soon after he will walk as he's already pulling up on everything too. He is super sneaky so we really have to keep an eye on him because he will grab whatever he can get and put it straight in his mouth! A few of his favorite things are Mickey Mouse, bath time (he's SUCH a water baby! ), & these soft books that crinkle and have all kinds of textures and things in them. He also just started within the last 3 days waving and it's the cutest little thing! I can't wait to see what milestone he will hit next! Hopefully I can conjure him into saying "mama" officially before "dada" ;) You bring so much happiness and love into our lives Finn man, we love to see you laugh, grow, and learn every single day. We love you bubs!